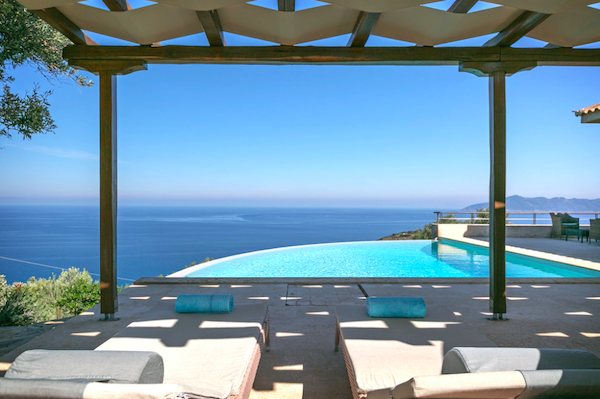 Reset your body, mind and spirit in Greece. Olivia’s Luxury Villas are two luxurious and elegant villas of 180square meters each, with private pool and surrounding garden. They are built next to each other, so that they can both enjoy the same breathtaking sea view, while at the same time each house maintains its privacy. They are surrounded by olive trees colorful plants and a wonderful private 40sq.m swimming pool each. The houses are located in the area of Kalyvia, only 2.5 km away from Skiathos town, 1 km away from Lehouni beach, 1.5 km away from Evaggelistrias Monastery and only 15km away from Koukounaries beach. The view from all corners of the villas is uninterrupted no matter if you are inside or outside, as the houses are built with the concept of having constant eye contact with the azure water. *Airfare, optional activities, travel insurance (mandatory) not included. Authentic Greek cuisine straight from Grandma’s recipe books. Enjoy a delicious homemade vegetarian menu, prepared with love and care by our family. Healthy and flavorful dishes made with seasonal local produce straight from the Farmer’s Market. Andrea is a Los Angeles based teacher and wellness advocate that has spent the last 15 years studying and practicing yoga, dance, pilates, meditation, wellness and healing practices. Andrea teaches a vinyasa based class and incorporates synergistic methods and experience acquired through years of searching for the things in life that feed one's soul. "Yoga saved my life. I was told, after a crippling back injury, that I would never run, swim, bike, dance, or engage in any strenuous physical activity again. Then I found yoga and my life immediately changed. It helped me heal physically as well as emotionally; nursing me through some of life’s darkest chapters. It is my great pleasure to share this gift of knowledge in order to help others. I believe that mental, spiritual and physical wellness allows us to a find a foundation to enjoy the rhythm of life on and off the mat. It’s about gaining consciousness and listening to our bodies and minds. Yoga connects the mind with the body, allowing us to express ourselves through the gift we have all been given: Our natural breath. With every class, we embark on a new journey. Allowing healing and growth on the mat that then transfers off the mat. That is yoga’s great and beautiful gift." Born and raised in Greece, Celia moved to Los Angeles, CA in 2012 to pursue a Masters degree and a career in the music industry. After realizing that the most rewarding journey is the journey inside, Celia founded CANYON TRIBE in an effort to share the healing powers of a healthy and balanced lifestyle. A world traveler, rock'n'roll devotee and follower of all physical and spiritual practices, she believes that the key to a happy life is embracing your unique and authentic self. Celia completed her Yoga Teacher Training (RYT-200) and her 500hr Comprehensive Pilates Teacher Training in Los Angeles, CA. She is a Mindfulness Meditation Instructor and a Reiki practitioner. She is currently teaching private Vinyasa and Restorative yoga, Meditation and Pilates classes at Hummingbird Pilates in Beverly Hills and Pilates Sports Center in Encino. Skiathos is an unspoilt and picturesque island of the Aegean, in the Sporades group. There are over 60 beaches with crystal – clear waters along the coast, some with golden sand and unique pine forests such as Mandraki beach, while others with white rocks (Lalaria beach) and pebbles (Kastro). The most famous is Koukounaries, which has been declared the third most beautiful beach in the Mediterranean. The traveler can choose from a wide range of clean beaches, from the secluded private ones to the cosmopolitan ones with beach bars and water sport activities (diving and snorkeling, water ski, wake board and many more). It is highly known for being a green island with pine tree forests and olive groves, bustling nightlife that attracts thousands of young visitors every year and amazing local as well as international cuisine. Skiathos is the nearest island to the mainland, with international airport, only 41 miles away from Volos, the capital of Magnesia region. It is only 2.5 hours away on the ferry from the port of Volos. It is also accessible from Agios Konstantinos port and Mantoudi port in Evia as well. Visitors can also enjoy activities such as biking, hiking, trailing or following signposted walking routes which pass through some of the most beautiful parts of the island with breathtaking sea views of the Aegean. They can also visit the historical monasteries, or do daily trips to the neighborhing small islands. We will meet in Skiathos island. We will pick you up from Skiathos Airport ‘Alexandros Papadiamantis’. There are direct flights from Athens as well as London, UK. If you require additional assistance in securing transportation please let us know. We have done this trip many times, we are happy to help!